In this draft, I have a few strong convictions, but none is stronger than my belief that Ryan Mallett will not be a quality starting quarterback in the NFL. Mallett, who holds his pro day at Arkansas today, isn’t the top rated quarterback – that falls on Cam Newton or Blaine Gabbert – but he is in contention with Jake Locker, Andy Dalton, and Colin Kapernick for first-round consideration. The pros for Mallett are obvious. He’s huge – 6-foot-7, 250 pounds – and has an incredibly strong arm. 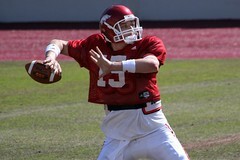 He fits the prototype of the dropback passer, and he got pro-level coaching from Bobby Petrino at Arkansas. Mallett threw for more than 7,000 yards in his two years as a starter at Arkansas, and he had 30 and 32 touchdown passes in those seasons. Mallett also showed improvement between the years, raising his completion percentage by 10 points. But that completion percentage is what worries me about Mallett. While I haven’t watched every game he played, my overwhelming perception is that he is inaccurate. I believe the Arkansas system masked this a little bit for Mallett, because Petrino’s such a good play caller. But Mallett, especially when pressured, sprayed the ball around way too much for my liking. Moreover, when Mallett got knocked out of the Auburn game, backup Tyler Wilson stepped in and looked almost as good as Mallett had moving the offense. That raised a red flag for me, because it raises the question of how much of Mallett’s SEC success is on him, and how much is system-based. Other off-the-field questions are circulating about Mallett, and if true they raise even more red flags. But even if Mallett was as squeaky clean as Tim Tebow, I wouldn’t spend a first- or second-round pick on him. The lumbering, big-armed passer doesn’t fit the trend in the NFL, and Mallett’s inaccuracy under pressure is a recipe for failure. It may seem like I’m pounding Mallett unnecessarily, but there’s no way I see him developing into a quality quarterback. We’ll look back at the two conference championship games individually. First up, the rivalry game in the NFC, in which the Green Bay Packers advanced to the Super Bowl with a 21-14 victory over the Chicago Bears. *Aaron Rodgers wasn’t the superhuman that he had been in the first two playoff games, but he did enough to get the job done for the Packers. He threw two interceptions (detailed below), and while he didn’t throw a TD pass, he did throw for 244 yards and run for 39 yards and a score. And now Rodgers is a Super Bowl quarterback, with the chance to rightly join the game’s elite with a win in two weeks. *Obviously, the big headline from this game from the Bears’ perspective is the Jay Cutler knee injury. He had to leave the game early in the third quarter due to an injury that he didn’t remember, and the Bears soon had to turn to third-stringer Caleb Hanie after Todd Collins reminded everyone he was not only old but ineffective. It’s not a good performance by Cutler, who was just 6-for-14 for 80 yards, including an interception late in the second quarter that cost the Bears a scoring chance. The fact that Cutler left the game will obviously be the cause of much consternation from Bears fans, but the fact that Cutler didn’t have his helmet after being pulled may indicate it wasn’t his decision. Regardless, it wasn’t a franchise quarterback performance from a QB for whom the Bears paid a premium. *Hanie played well in relief of Cutler and Collins, leading the Bears’ first scoring drive thanks to a beautiful 32-yard pass to Johnny Knox that set up Chester Taylor’s one-yard TD run. He also threw a great pass to Earl Bennett that turned into a 35-yard touchdown. Hanie finished the game with 153 yards passing, and definitely provided a spark. But Hanie also threw a Cutler-esque interception to B.J. Raji, a nose tackle who had dropped into coverage on a zone blitz. 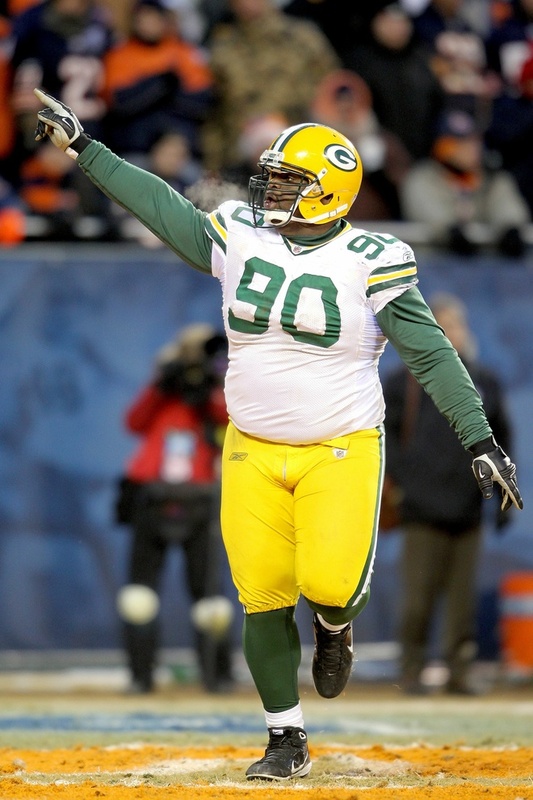 Raji took the ball 18 yards for a touchdown to make it 21-7, and that touchdown proved to be the difference. And Hanie’s fourth-down interception to Sam Shields cemented the game for the Packers. *The Packers got off to a quick start with three 20-yard-plus passing plays, all to the same spot on the field. Rodgers picked on the seam in the zone behind the undersized Tim Jennings and in front of safety Chris Harris, who was playing despite a hip injury suffered last week. Those three plays – two to Greg Jennings and one to Jordy Nelson – set up Rodgers’ one-yard TD run for the game’s first score. The Packers exploited that spot at least three more times for big gains throughout the game. It was clear early on that they wanted to test Harris to see just how soft that spot in the zone would be. *The Packers have stars on defense like Clay Matthews and Charles Woodson, but it was the lesser known guys that really starred in this game. Cullen Jenkins produced a ton of pressure, especially early, notching half a sack and two tackles for loss. Nickelback Shields had a sack and forced fumble on Cutler to stop one drive in the second quarter, and then he picked off Cutler to stop the Bears’ last drive before the half and picked off Hanie to salt away the game in the final minute. And Desmond Bishop was also a nice factor for the defense with eight tackles, including a key tackle for loss on the next-to-last Bears snap of the game. Those performances show just how deep the Pack is. 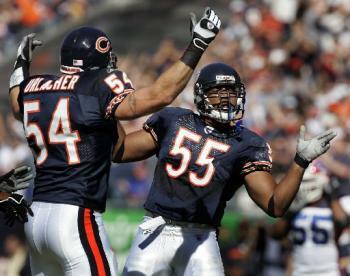 *For the Bears, the defensive star was no surprise – Brian Urlacher. Urlacher piled up stats in several categories – a sack, a tackle for loss, and an interception near the goal line to stop a Green Bay scoring pass – and seemed to be the guy stepping up to make big plays over and over again. Julius Peppers didn’t fill up the stat sheet nearly as much, notching just two tackles, but he provided pretty consistent pressure and drew a holding penalty that was as good as a sack. However, Peppers also got a 15-yard personal foul for a helmet-to-helmet hit on Rodgers. *James Starks had a good game for the Packers, but the best running back on the field was Matt Forte. Forte thrived throughout the game, despite Chicago’s QB problems. 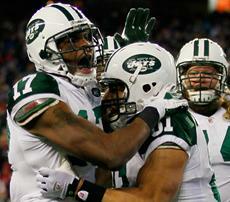 Starks ran for 74 yards and a touchdown, while Forte ran for 70 yards and had 90 receiving yards on 10 catches. *The Bears’ lone glimmer of hope in the first half came on a fluky play, when Donald Driver bobbled a low pass, and then Lance Briggs caught the carom off Driver’s foot for an interception. The play, which was reminiscent of how Seattle’s Mike Williams caught his second touchdown against Chicago’s Charles Tillman in the divisional round, gave Chicago a chance at a two-minute drive, but Cutler threw an interception to quell that rally. 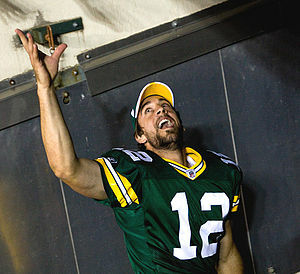 Still, the deflection was Rodgers’ first interception this postseason. *It’s hard to imagine a team having a better fourth receiver than Nelson, who had eight catches for 79 yards and a touchdown against Atlanta and followed it up with another big day against the Bears with four catches for 67 yards against the Bears. Rodgers has a lot of trust in Nelson, even though he’s down the depth chart from Jennings, Driver, and James Jones. We’ve hit a lull in our suicide pool suggestions, as the Texans laid an egg at home last week. But this week offers much better choices for players. 1. 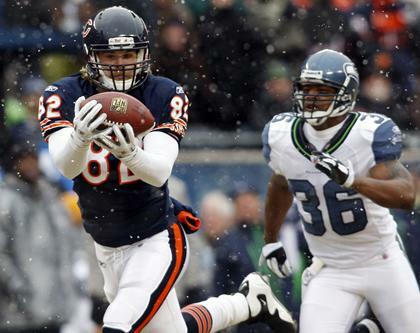 Bears over Seahawks – Seattle is 2-2, but they’ve looked bad away from home. The Bears should have a solid home-field advantage, and their defense is plenty good enough to shut down Seattle’s attack. So if Jay Cutler plays OK, the Bears are a safe choice. Note that over the last couple of years, the Bears have done a good job of putting away bad teams, which makes them a safe suicide-pool pick. 2. Steelers over Browns – This is the ultra-safe pick of the week, but we’re going to leave the Steelers on the table for later in the year. Pittsburgh’s defense has been dominant all season, and with Ben Roethlisberger starting against rookie Colt McCoy, the Steelers have a ton more offense at their disposal as well. If you’re risk-adverse, this is your pick. 3. Giants over Lions – The Giants have played well the last couple of weeks, and now they welcome in the Lions, who haven’t won a road game in what seems like forever. Detroit has played pretty tough in games like this, but they haven’t broken through and won, which makes the Giants a good bet. Trap to avoid – Chargers at Rams – The Chargers have a highly rated offense and defense, but special-teams meltdowns have cost them. They’re 0-3 on the road, and the Rams are 2-1 at home. Given those trends, and given the fact that the Rams seem to be ascending, this is a time to stay away from the Bolts.